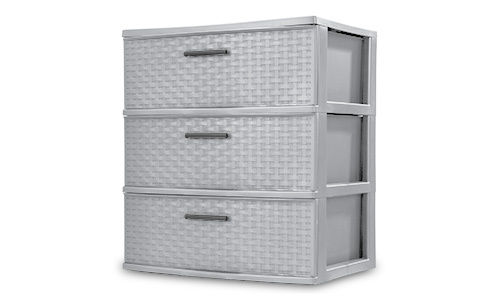 Organize visible storage areas with the Weave collection. These Weave Storage items combine style and function; the trendy look of weave with the convenience, durability and value of plastic to provide a variety of décor solutions for your living spaces. 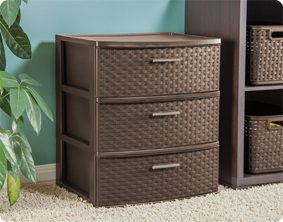 The 3 Drawer Wide Weave Tower takes on a furniture-like look and is ideal for “out in the open” storage needs. Three opaque drawers keep clutter controlled and concealed while providing access to frequently used items, where they are most often used. The easy pull handles allow drawers to open and close effortlessly, with a drawer stop to prevent drawers from being removed accidently. The overall dimensions for this item are 15 7/8" L x 21 7/8" W x 24" H.
Overall Assembled Size: 15 7/8" x 21 7/8" x 24"
This versatile, decorative storage solution is ideal for use throughout the home, adding a décor look to visible storage areas. 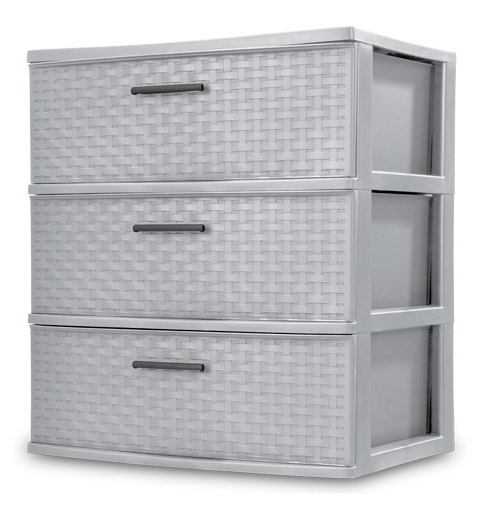 3 Drawer Wide Weave Tower is rated 4.6 out of 5 by 8. Rated 2 out of 5 by Rose from Drawers very difficult to slide in and out when anything more than a few lightweight items inside. I bought several of these drawers, pleased with the look and the cost. But I am very dissatisfied with how they function. The drawers are very difficult to slide in and out when there is anything but the very lightest of items. The drawers are not well supported or guided so that they can be opened and closed exascept with great difficulty. I basically wasted my money because they function so poorly! Rated 5 out of 5 by Anitra724 from I love this product!! I absolutely love this product! I have several 3 drawer containers as well as recommended and buy them for those looking to organize in a stylish way. I’m super excited about the new spring colors. I feel like they fit everywhere, Closets, garages, bedrooms and bathrooms! Rated 5 out of 5 by Tranquility01 from Every client I’ve had purchased this item! This is ONE of many of my favorite items! I have an organizing businesses and when I put my packages together, this is ALWAYS one of the items on the list. It’s durable, stylish and I’m super excited that’s it comes in more colors! Also, when clients and myself move or transfer things, it’s easy to pick up and go! I highly recommend this item! Rated 5 out of 5 by foolsewing from All Sterilite products are great!! This specific drawer unit I love have had one for many many years and just got another for my office space. I have a friend that uses her inside her closet as a dresser. It looks good and drawers roll in and out smoothly. Rated 5 out of 5 by Sandra54 from I Love It! My house doesn't have much storage space so I decided to get 4 of these units. They look great! Very roomie and look nice. Unfortunately, one of the pull handles were missing. I contacted customer service and got a feedback the very next day saying that the missing part would be sent to my home address by mail. I'm so happy with my purchase and with Sterilite's customer service, I'll be buying more. Rated 5 out of 5 by mom4the4 from Need more of these I bought two of these to use as night stands in our bedroom. They are perfect. I want to get the 4 drawer units to use as dressers. We have a damp apartment and the Sterilite units are awesome at keeping everything dry and mold and mildew free. Rated 5 out of 5 by QiimiihLee from Amazing Product This container was more than I expected. When I first saw it in person I swore it was real until I inspected it. I bought four of them to use side by side as my drawer vanity. My old furniture was broken and needed to be replaced. I use them everyday and they require little to no upkeep. They are easy to clean, lightweight, and still holds up to all my items. This is by far the best buy I bought for my home. Its completely functional and it was so inexpensive. I'd have spent a fortune had I bought real wood with the same look from another company. Definitely recommend. Rated 5 out of 5 by aquaticamonstrr from durable and pretty. I got two for under my open kitchen counter. I was worried they wouldn't be big enough for my summer guest's cloths and was pleasantly surprised. I honestly figured they would be warped by the end of the season from daily use, and was happy to be wrong again - not to mention they are honestly gorgeous.